Parliamentarian Ngawang Tharpa Gewatsang on behalf of the Standing committee of Tibetan Parliament-in-Exile attends the abbot enthronement ceremony of Zeekgyab Rinpoche on 11 February 2019 at Tashi Lhunpo Monastery, South India. The grand enthronement ceremony of 5th Zeekgyab Tulku of Tehor, Tenzin Thupten Rabgyal as the Abbot of Tashi Lhunpo Monastery commenced at 10:30 am with a ceremony at his chamber. 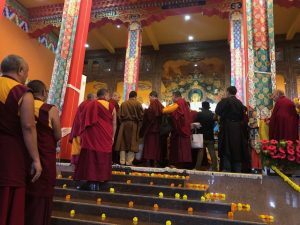 Initially, heads of Monastery and patrons ushered Zeekgyab Rinpoche with aromas of incense towards the great prayer hall of Temple and then to the debating courtyard for Tsishag ceremony. Parliamentarian Ngawang Tharpa Gewatsang on behalf of the standing committee of Tibetan Parliament-in-Exile offered ritual objects (Mendal ten sum) to the 5th Zeekgyab Tulku. The dignitaries including Justice Commissioner, Karma Dadul, welfare officer, Gelek Jungney, representatives from other Monasteries, representatives from government and non-government organizations, other dignitaries and the public received blessing from the new Abbot and finally, the ceremony wrapped up with a sumptuous lunch for all.